was designated for a national intangible cultural folk asset. 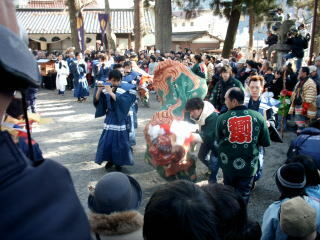 It is said that the origin of this festival was based on ta-asobi. a good crop of rice in advance. Farmers make themselves up as old couples, a leader of rice planters, young female rice planter called saotome, etc. Then, they show the process of growing rice by mimic play in a shrine. In this case Asobi means kagura, not games. On February 7th they elect a shinto priest. 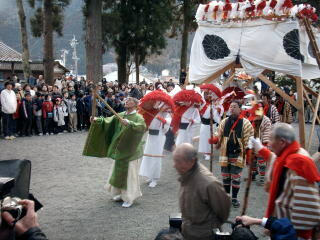 Then they hold shinto rituals every day. for Mori Minashi-Hachiman Jinja (shrine). kotakebashi (chopstics ) and dango (a kind of Japanese sweets).